During a drought, healthy natural grazing could provide a lifeline to many livestock farmers. In the Western Cape in particular, taking care of renosterveld fragments during the good years can provide that essential grazing when times are tough, says Keir Lynch of the Overberg Renosterveld Conservation Trust. The drought in the province has already cost the agricultural sector nearly R6-billion, according to the Western Cape government. Nearly a quarter of sheep herds in the province, and 5% of other livestock have been slaughtered because of grazing and feed shortages, says the Western Cape Department of Agriculture. Ecological burns are a crucial part of a management plan. If undertaken properly, renosterveld species such as the favourable Rooigras (Themeda), Blougras (Ehrharta) and palatable shrubs and vygies will grow post-fire. “Controlled burns should be used for ecological reasons, and should include an assessment of the veld, and a five-year controlled burn strategy coupled with a grazing plan,” he says. For example, burning too frequently will destroy key renosterveld species. The ORCT recommends burning every 10 to 15 years, based on the condition of the veld. Lynch says the aim is to create a mosaic of veld ages on the property – which in turn gives refuge to the animal life that depends on renosterveld. He also says the ideal time to burn is late summer to early autumn. 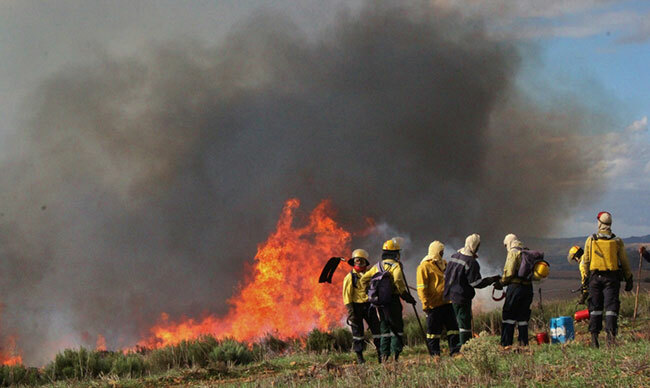 Burning in April is acceptable in some cases – especially when the veld is very old. But he warns that burning during late autumn could destroy bulbs just as they push out their leaves. Ecological burns should never take place in winter or spring. Because burns generally take place during fire season, the ORCT helps landowners to ensure firebreaks are in place – to reduce the risks of wildfire. 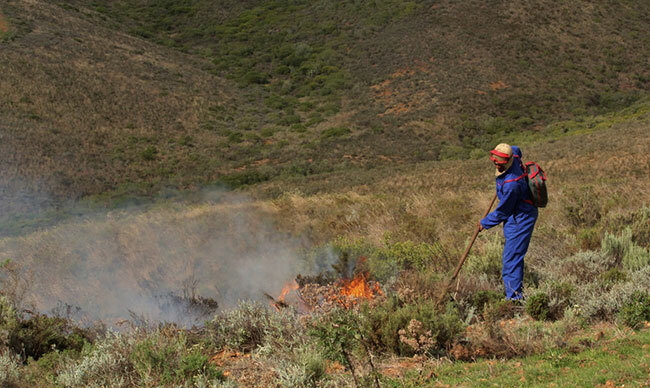 The ORCT has partnered with the Greater Overberg Fire Protection Association and the Overberg District Municipality to ensure safe ecological burns which best conserve critically endangered ecosystems, including renosterveld. 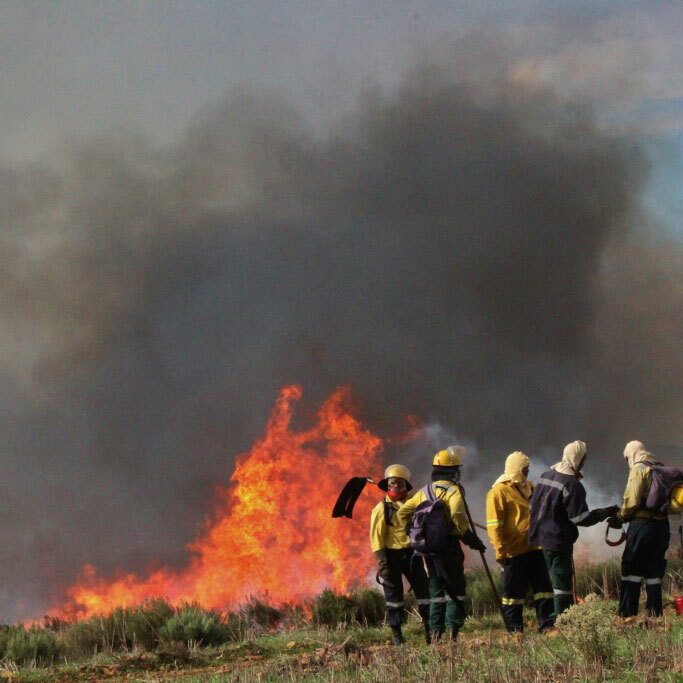 One such ecological burn was recently undertaken at the Kinko Conservation Area in the Breede River Cluster, where 30-year old veld was burned. The burned area has been fenced off, to prevent grazing, and alien vegetation that may grow will be prioritised for clearing.